BSOD of while using Utorrent. As the topic says, I get BSOD while trying to download torrents. I have gone into the preferences that I have seen recommended by other people when google searching. I've even tried disabling my anti-virus (zone alarm). I have been using utorrent and zone alarm together for over 7 years. How ever a few weeks ago it started BSOD a few minutes after I begin to download. My laptop does not BSOD any other time. My laptop is an MSI. I have also checked all my network adapter drivers and they are all up to date. I will also upload a picture of my BSOD error. I need any help anyone can provide me. Have you made any changes, added any network monitoring programs or updated incompatible network/wifi drivers? I have not added any network monitoring programs (I don't even know what these are lol) and I haven't updated any drivers, other than checking that they were up to date which they were. To check if you have the latest drivers you really should go to the company website and do not rely on device manager to update. Redownloading my wifi network adapter now. I googled the name of it and found it. So going to try that. 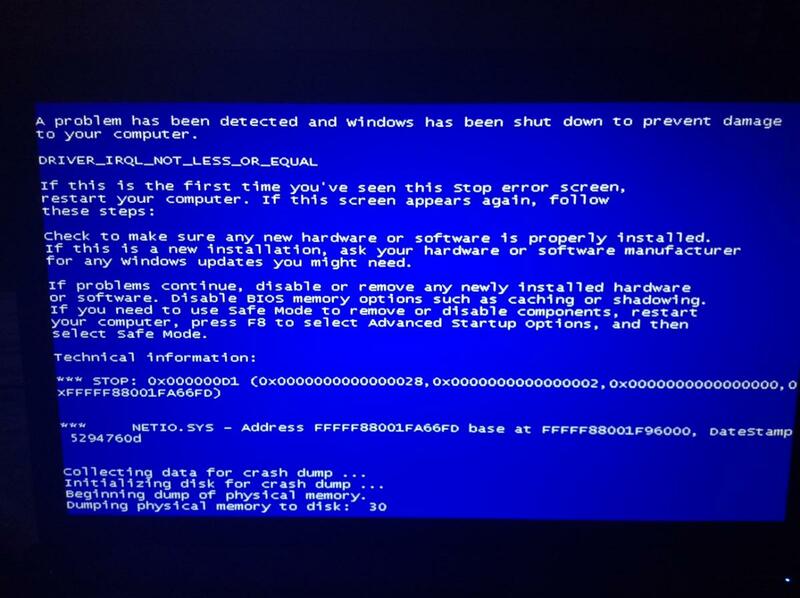 An off question, I was reading in another thread about the .netsio or w/e error that is near the bottom of my BSOD screen, that it is related to Norton. My laptop came with Norton preinstalled when I got it back in January 2014 (keep in my mind my BSOD started about 2 weeks ago). I always completely uninstall Norton and any of its components in favor of my current anti-virus. I doubled check my installed programs and found no trace of Norton. Does the .netsio error pertain to norton, or is there a different way for me to check if there is any remnant of norton still on my laptop. Two of which point the finger squarely at either network adapter drivers or broken internet security software. McAfee and its remnants are known to cause these issues in cases where it's not the network adapter. Ahh, I'm leaning towards it was a broken network adapter of some sort. Because I downloaded at reinstalled at the advice of Beasly (THANKS SO MUCH). I've never had mcafee on my laptop. It did how ever come preinstalled with Norton which Beasly also helped me get rid of. I downloaded a movie (just to test utorrent) for about 2 hrs. It didn't crash, so I'm hesitant to its completely fixed, but for now all seems good. I have utorrent running on 2 desktop PC's; one at home and one at work. BSOD appears on the home PC, but not on the one at work. would completely uninstalling utorrent and then reinstalling the software cure this fault. I get the same 'NETIO.SYS error as shown on the thumbnail in another post here. Did you try updating your network drivers? I checked my drivers after my last post and needed up dates on two of them, which I completed. I also system scan and that found nothing amiss. I then tried utorrent again and successfully downloaded, the problem re-occurred when I left the torrent to 'Seed'. Having had another BSOD I did a complete uninstall/reinstall. I then carried out another download, but did not 'Seed' this time and nothing crashed. When I next open utorrent I will hopefully proved that the new installation has fixed my problem.